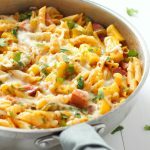 This Cheesy One-Pot Hawaiian Pizza Pasta is a delicious weeknight meal and the perfect reason to skip the take-out pizza! Add the pasta, the vegetable stock and the water to a large pot or pan over medium high heat. When the mixture comes to a boil, reduce the heat to medium and cook the pasta until almost all the liquid has been absorbed, stirring regularly to prevent the pasta from sticking to the bottom of the pan. Turn the heat to low. Add the pasta sauce, the ham, and the mozzarella cheese, reserving 1/2 cup of the cheese for the end. Stir everything together well until the cheese begins to melt and a sauce forms. Stir in the bell pepper strips and pineapple chunks and continue to cook on low just until the peppers and pineapple chunks begin to soften. Add the rest of the mozzarella on top and sprinkle with some cilantro for a garnish, if you wish.